Welcome to the Medora Ranger District, on the Dakota Prairie Grasslands near Marmarth, North Dakota! This “paleo” project will be hosted by both the Forest Service and the North Dakota Geological Survey. During this PIT project we will, once again, be hunting for fossils within the famous, Late Cretaceous Hell Creek Formation. The Hell Creek Formation is chock full of turtles, Champsosaurs, crocodiles, birds, small mammals, clams, snails....and let's not forget the dinosaurs! 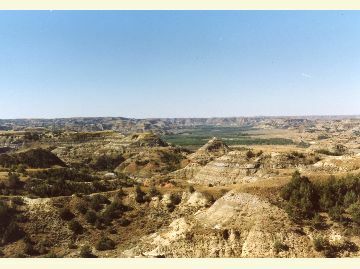 We will be scouring the badlands for microfossils in anthills, searching for skeletal elements exposed on the surface, and conducting excavations to get the critters to the North Dakota Heritage Museum. We will have a base camp with all the amenities of a hotel…well, except for solid walls and flushable toilets. This is the first Paleontology Passport in Time project on this Forest Service unit, and we are excited to explore here! We hope you’ll join us this summer for this next “dino” hunt – see you in August!